No one can say for sure why cats have chosen to live with us. It may be that they are observers, watching the progress of human beings. Perhaps cats are our spiritual guides. Even if you believe that cats are merely persuaded by the simple bargain of warmth and food in exchange for companionship, there is still much to be learned from their life strategies. 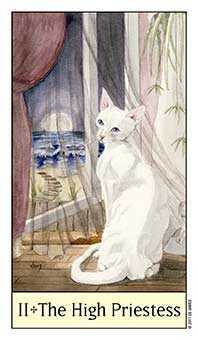 The Cat’s Eye Tarot deck is illustrated from a feline point of view. These cats are portrayed behaving like cats. They hunt, play, love, fight, and contemplate the mysteries of the universe. Because cats rely upon visual signaling to communicate at a distance and avoid physical conflict with other cats, they are experts in the subtle art of body language. Cats are so good at “reading” our body language, they may seem to be psychic. 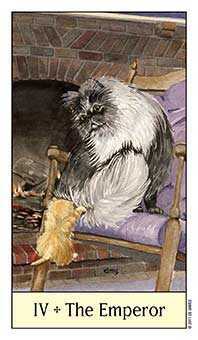 People can learn to read their cat’s mood by posture, set of the ears, and the carriage of the tail. Anyone who has lived with a cat, or observed them crouched and tense, or relaxed and ready for affection, knows what is being communicated and responds accordingly. 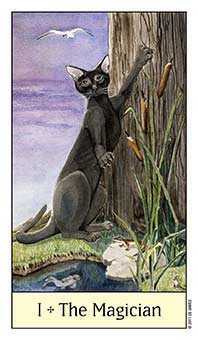 Moreover, cats are pleasing to the eye, complex in their behaviors, and mysterious in their motivation; an ideal model for a visually evocative medium like the Tarot. 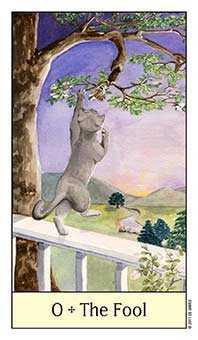 The card meanings, numbering, and suits in Cat’s Eye Tarot follow the Rider-Waite-Smith tradition as interpreted by Joan Bunning in her book Learning the Tarot. The suit names are the familiar Wands, Cups, Swords, and Pentacles. Color is used to convey suit energies, establish continuity, and orient the reader as you become familiar with the deck. 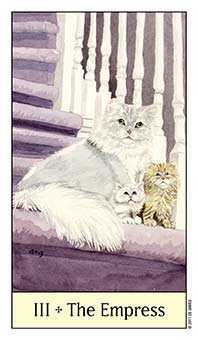 The Major Arcana are purple, denoting important events and spiritual matters. In the Minor Arcana, wands are orange (creative energy); cups are red (emotional energy); swords are blue (air, clarity; intellectual energy); and pentacles are green and brown (earthy; practical; natural). Initially, cat coat colors were chosen to coordinate with the suit colors, but they also work well with the suit energies – solid practical brown tabbies for pentacles; sweet black and white for cups, talkative Siamese for swords, and flashy red tabbies for wands. Reptiles (wands), fish (cups), birds (swords) and mice (pentacles) replace the usual suit symbols and appear when appropriate for the activity illustrated. These creatures were chosen because they are all the natural prey of cats. 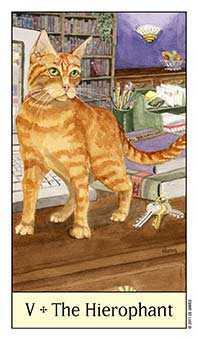 Also, lizards, birds, and fish appear in Pamela Smith’s illustrations so they are familiar to Tarot practitioners; and finally how could you have a cat deck without mice? I have been a practicing veterinarian for 28 years; 22 of them in an exclusively feline practice so cats hold a special place in my heart and mind. For me, the Tarot has become a tool for reflection and a way to think through a situation. I use the cards for myself and with others. Balancing emotion, intellect, creativity and practicality are important for the health and wellbeing of people and cats. Cats can teach us many things about how to make the best of almost any situation. 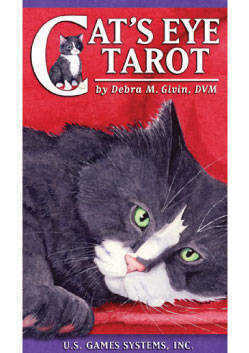 Let these cats guide you as you use the Tarot to learn about, yourself and your cat.